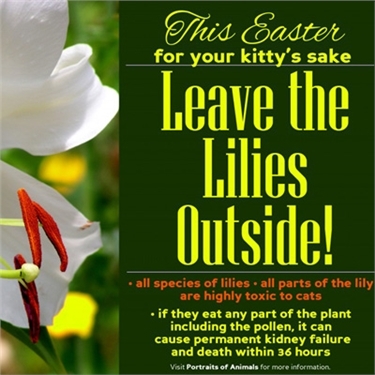 Many cat owners are unaware that all parts of lilies are toxic to cats possibly leading to kidney failure. They can be affected by eating any part of the plant, i.e the leaves, pollen & flower and it is thought they can also be affected by simply brushing past the flower and then grooming the pollen from their fur. Signs of poisoning in cats include repeated vomiting, collapse, severe diarrhoea or excessive irritation of the mouth or throat (red, sore or blistered), blindness and paralysis so if your cat exhibits any of these symptoms or you suspect it might have had contact with lilies it is vital to get them to a vet as soon as possible and if possible take a sample of the plant, or preferably the label, to the vet with the cat, as this will help the vet find the appropriate antidote.